Apple Mac Computers are considered to be much safer than Windows computers at keeping out the viruses and malware, but the new Exploit discovered by researchers again proves it indeed quite false. Last year, The Hacker News reported a deadly simple exploit that completely bypassed one of the core security features in Mac OS X known as Gatekeeper. Apple released a patch in November, but now the same security researcher who discovered the original Gatekeeper bypass vulnerability said he found an equally obvious workaround. Patrick Wardle, ex-NSA staffer and head of research at security intelligence firm Synack, said the security patch released by Apple was "incredibly weak" and that the update was "easy to bypass" in minutes. 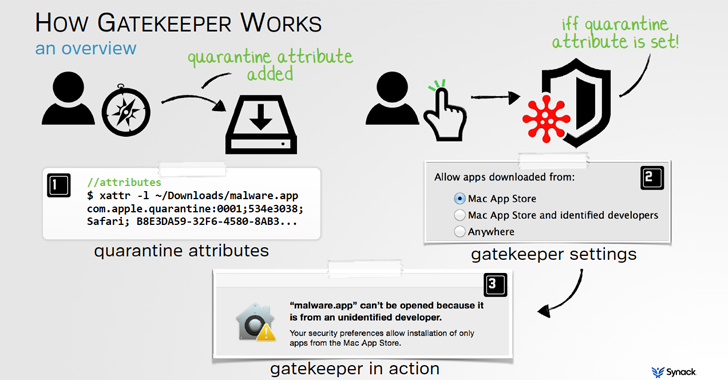 Introduced in July of 2012, Gatekeeper is Apple's anti-malware feature designed to block untrusted, dodgy apps from running, keeping Mac OS X systems safe from malware. However, the reality is slightly different, according to Wardle. Hackers can install malicious software on Mac computers, even when Gatekeeper is set to its most restrictive setting. "Even on a fully-patched OS X 10.11.2 system, Gatekeeper is trivial to bypass," Wardle wrote in a blog post. "So hackers can (re)start their trojan distributions while nation states can get back to MitM’ing HTTP downloads from the internet." But, what Gatekeeper fails to check is – whether the app already trusted by OS X runs or loads other files from the same folder. However, in the name of a security patch, all Apple did was simply blacklist the signed apps Wardle was abusing to bypass Gatekeeper, rather than fixing the underlying problem. How to Bypass Gatekeeper in OS X? This was not effective in preventing attacks. Wardle found a new Apple-signed file that allow him to do the same. Notably, the file was offered by the popular anti-virus firm Kaspersky Labs. Now, Binary B needs no digital certificate or Apple developer certificate to run, so it can be used to install anything the attacker wants, completely bypassing Gatekeeper. Wardle notified Apple about his latest finding, and the company rolled out an update blocking the new files Wardle privately reported it, which is not a right approach. Apple should come up with a more comprehensive fix to address the issue. In the meantime, Wardle suggested Mac users to only download software from the Mac App Store and be more careful while downloading apps from the internet. Wardle will be presenting his findings at the Shmoocon conference in Washington D.C this weekend. He also released a complementary tool for Gatekeeper on Friday, a free tool dubbed Ostiarius, that checks all file executions and blocks untrusted, unsigned code originating from the Web. Alternatively, otherwise, it might be time to fire Gatekeeper, and hire a new one.